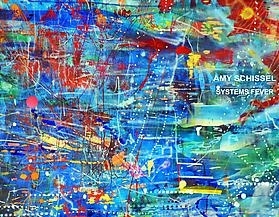 PATRICK MIKHAIL GALLERY is pleased to present AMY SCHISSEL: SYSTEMS FEVER, a new catalogue 2011 RBC Canadian Painting Competition Finalist AMY SCHISSEL. PATRICK MIKHAIL GALLERY is pleased to launch AMY SCHISSEL: SYSTEMS FEVER the first catalogue in our new initiative entitled PATRICK MIKHAIL PUBLISHING. The catalogue features a foreword by curator Sandra Dyck and an essay by artist, curator, and scholar Petra Halkes. The catalogue is launched in conjunction with the exhibition entitled SYSTEMS FEVER, the artist's first solo exhibition with the gallery. The paintings in SYSTEMS FEVER stem from Amy Schissel’s ongoing pursuit to address the progressively dematerialized quality of our data driven and media saturated culture within the realm of abstract painting. Whirling schemata, concentrated notational systems, intense color saturated surfaces, and web-like linear structures negotiate hybrid moments where paint and modes of digital representation collide. These systems, frenetically layered to visualize the largely invisible information flows that cut across cities, hover over continents, and seemingly negate the need of geographical location for human interaction and communication. Schissel’s recent paintings are an imaginative reinvention of our contemporary landscape: they have become a means to re-insert a sense of civic legibility where the World Wide Web calls us to be everywhere and nowhere at once. The works evolve through obsessive, repetitive mark-making where paint and other media are layered, and re-formed in order to almost mysteriously find the resulting images; a collage of plaster, hot and cold wax, recycled drawings, ink, acrylic and oil paints, markers, and colored paper shreds. The surface is then worked into by cutting or peeling away at the various layers, which are re-attached on the surface once spatial shifts begin to emerge. This regenerative process allows Schissel to invent, find, and react to emerging systems and sequences that command investigation and inform the evolution of linear networking. Although the making process is inspired by gains and losses of information that occur within digital translations, the paintings are not digitally constructed. Rather, they are tactile, hand-made cartographies, tracing out amorphous webs of information flows that parallel our physical geography. These paintings aim to re-invigorate abstraction while maintaining relevance to a data-driven environment by subscribing to the processes of digitization within the time-honored strategies of painting. Amy Schissel was a finalist in the 2011 RBC Canadian Painting Competition. Her work can be found in the collections of the Canada Council Art Bank, the Department of Foreign Affairs Canada, the Free University of Brussels, Belgium, and the Gotland Museum of Fine Arts, Sweden, in addition to numerous private international collections. She completed her BFA in 2002 from the University of Ottawa and her MFA from the University of Ottawa in 2009. She was Canada’s 2009 recipient of the Brucebo Fine Arts Award, and has exhibited both nationally and internationally, including solo exhibitions at the University of Brussels Gallery, Belgium; Karsh Masson Gallery in Ottawa; and Centre d’art Imagier in Gatineau, Quebec. She is the recipient of various grants and awards from the Canada Council for the Arts, Ontario Arts Council, and City of Ottawa. In November 2010 she was featured in the exhibition “4 Ottawa Painters” at Carleton University Art Gallery. Schissel lives and maintains her practice in Gatineau, Quebec.